Anne Huffington didn’t start diving or flying until she was in her forties. When I was 40 I miscarried my third baby and was aware that motherhood would not be in my future. I asked myself what I could do now that I could not have done as a mother, and the answer was “learn to scuba dive”. That set me on a course of diving all over the world. At a Professional Women’s Network event, I found myself in a hot tub with the Jungian Therapist and Author Jean Sinoda Bolin, who asked me what my passion was. I described diving to her ? going deep into gathering dark water off the Monterey Coast kelp forests until an underwater world opened up to delight my eyes. She said, “I would guess you are also in deep grief therapy because what is manifesting on the exterior is often what we are pursuing on the interior. As it turned out, I was going through therapy 3x/week ? called doing “black hole” work on buried trauma. I thought about those concepts and decided that perhaps we could shape our interiors by what we did in the exterior, and I figured it was time for me to fly! There was a school for budding paraglider pilots down the road from where I lived in Northern CA. I signed up for a class. At first you walk uphill a little ways, then lay out the glider and run down. As the day progressed I got high enough on the hill to find myself in the air while running, and I knew I had found something I loved. It was as if my dreams of flying had turned into reality. I was hooked. 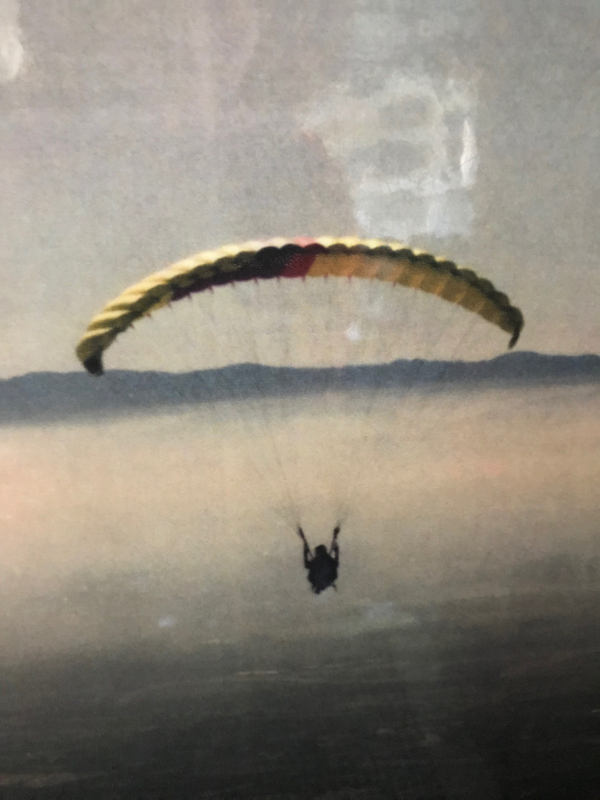 I signed up for the package of 10 lessons, and paid about $3,000 for my own paraglider ? a yellow and purple Wills Wing I named “Glory”. With my Novice designation I began to fly at the Pacifica coast ? a place affectionately named “The Dump” ? hang-gliders flew to the north at Fort Funston. I carried my paragliding backpack in the trunk of my car and most days during daylight savings time I could be found flying at The Dump. I would change from pantyhose to a flight suit in my car in the parking lot and walk to the launch areas. 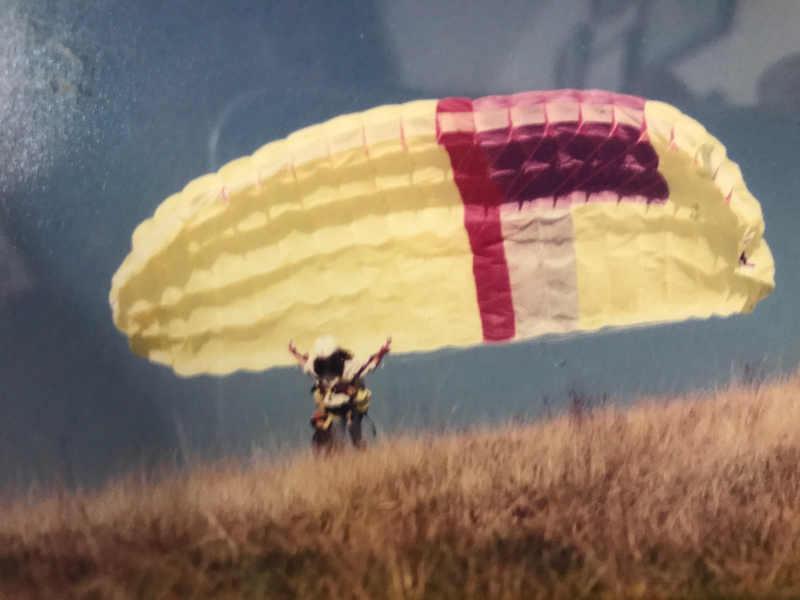 I progressed to an Intermediate Level (the designation stickers were worn on the helmet) and after some years because the first female President of the Bay Area Paragliding Association. My longest flight was about 5 hours, and as I launched I would inwardly say “C Ya” as I yelled “Clear”. It was a thrilling time of life!